Red Brick Brewing Company, as I wrote in 2014, “should have shut down approximately 21 times in its 21 years.” Of course there was hyperbole in that statement, but there are more than a few reasons why it’s surprising that Georgia’s oldest brewery is still alive and kicking, celebrating 25 years in operation this weekend. The strange and unexpected quarter-century includes a near-sale to Anheuser-Busch in 1996, stories of coworkers physically fighting each other, forced distributor partnerships, multiple rebrandings, wildly varying beer quality—hell, even the brewery's name has changed. 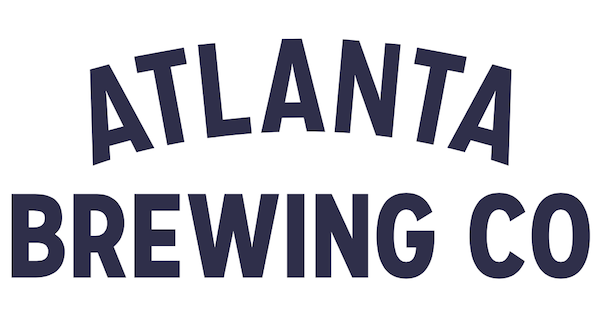 It was originally called Atlanta Brewing Company when it opened in 1993, switching to Red Brick in 2010 during one of its several corporate facelifts. And today, like the phoenix bursting from the flames on ATL’s city seal, the business is reborn once again as Atlanta Brewing Co.
McKenna tells GBH that, despite work in recent years to improve quality, it has been hard to avoid feeling "invisible" because of the variety of past mistakes made by the company. President Garett Lockhart says that three members of his management team—McKenna, marketing director Cameron Davis, and sales director Matt Wells—brought the rebrand idea to him. He was energized by their ambition and had them put together a presentation which was immediately approved by the brewery’s board of directors. 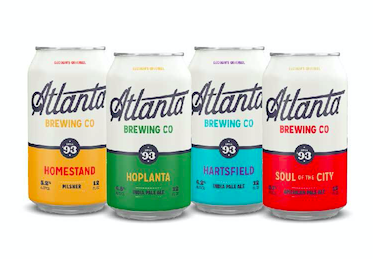 From there, they got to work with Indianapolis branding firm CODO Design to build out Atlanta Brewing Company’s new look. That look's associated assets have a bit of a vintage feel to them, and include additional colors. Compared to the previous branding, where the Red Brick logo was quite literally a red brick and the assorted forms of packaging went in various, seemingly unrelated directions, this new approach feels more cohesive and flexible. And at the very least, it’s easier on the eyes. But the question remains, of course: How will it perform on shelves? McKenna left Wrecking Bar Brewpub for Atlanta Brewing (then Red Brick) in 2017. Impressed with the headway Lockhart and lead brewer Steve Anderson (who left to work for Dry County Brewing Company in Kennesaw, GA when McKenna joined) had made in the previous five or so years, the job appealed to him because he saw potential. But the task at hand was nevertheless overwhelming and stressful. McKenna considers himself lucky he didn't face a mutiny. Changes to process, ingredients, organizational structure, and more upended norms for the brewery—again. But the struggle was real as growth was non-existent. According to estimates by the Brewers Association, Red Brick's production levels went from 8,741 to 8,883 to 8,000 barrels from 2015 to 2017. There are physical changes to the brewery, too. Atlanta Brewing has upgraded its taproom in the wake of game-changing legislation that allowed Georgia breweries to start selling directly to customers in Sept. 2017. The brewery’s own-premise space went from eight to an ambitious 28 taps pouring 20 unique beers, many of which are unavailable elsewhere, including adventurous offerings such as Brett Pale Ales, local collaborations, and various sour beers. These are not the kind of beers the Brewery Formerly Known As Red Brick was known for producing, and that seems to be the point. More than just a facelift, though, Atlanta Brewing is doubling down on a city that’s having a bit of a cultural moment lately. There’s Donald Glover’s eponymous, critically acclaimed television show (not to mention the generous tax incentives that have enticed much of the rest of Hollywood to head to The Peach State), a groundswell of public support and record fan attendance for the Atlanta United soccer team, and increasing talk of Amazon HQ2 choosing ATL as its destination. While before, much of the city’s status may have been focused around its prominence as the rap music capital of the world (a title that it still owns, incidentally), there are now myriad other reasons to get excited about Georgia’s capital—including it’s food and drink scene. Putting that all in perspective a bit, this a brewery that was tied to locality at a time (1993) when it was less important, and now finds itself coming back around to that in a time (2018) when it’s often seen as essential. But what happens if it doesn’t work? Beer consumer attention is notoriously fickle. Some drinkers likely won’t give the brewery another try. Others, even if they’d never heard of it before, may be overwhelmed by choice or perhaps just prefer to visit their neighborhood taproom. What’s the backup plan? Is there even one? Wait, is this the backup plan?